Holberts Oyster Supplies are a family owned business that have been operating over 5 generations. The business is currently directed by Bobbie Holbert, Trevor Holbert, and brothers Guy and Clark Holbert. 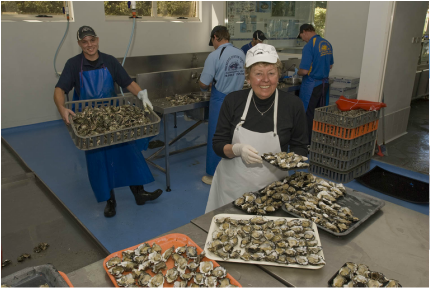 • The business employs 20 experienced staff which are led by processing manager Geoff Sharpe, Australia’s dual winning Oyster opening champion. • Holberts Oyster Supplies in its current operation has been located at Salamander Bay for over 30 years. • In 2000 Holberts moved to new premises at Cromarty Bay Salamander. These premises have been engineer designed specifically to enhance production and meet with food safety specifications. • Holberts Oysters are the largest supplier of oysters in the Port Stephens, Newcastle, Hunter and Central Coast regions. Their product is distributed not only to restaurants and food outlets but also to wholesale suppliers. • Over the last 20 years Woolworths have welcomed Holberts Oyster Supplies to their supplier team. As is well recognized Woolworths expect efficiency, freshness and value for money and Holberts Oyster Supplies recognize that challenge and believe they meet it well. • Holberts supply Woolworths with bistro Sydney Rock oysters on half shell, pacific oysters and bottled oysters daily direct to their stores. • Holberts Oysters recognize their small beginnings and owe their success to the local community. In return and with the establishment of their waterfront property customers our now able to not only purchase opened Sydney Rock, Pacific oysters, bottled or unopened oysters they are also able to purchase varied grades of prawns and take away or enjoy their meal in the grounds over looking the spectacular Cromarty Bay.